While at the beach, the subject of what is under those beautiful waves always comes up. Even the days when it is as if you were looking through glass at the sand covering the floor of the ocean, there is the unknown of what may be hiding in the waves as they roll in and sweep over you. The ocean is filled with “critters” and the media does an excellent job of keeping us informed of all those that could be dangerous. We get so wrapped up in the fear of the “What if’s”, we forget the beauty of the “And & But”. 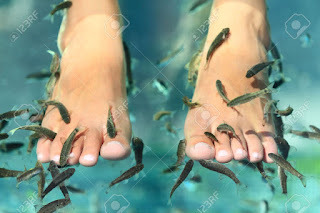 There are fish from the very tiny to those the size of your hand which nibble at your feet. Critters of the deep—low on the food chain and yet we cringe when surprised by their presence in the place they call home. We squeal and jump when they nibble at our legs as they dangle in the ocean. Those tiny fish critters have no teeth and cause no harm in their search for a morsel of food. In fact if we turn off the danger alarm, their little nibbles tickle as they toothlessly mouth our feet and legs. As schools of fish dance through the water, it equals the most beautiful of ballets as they move as one body—these small and beautiful critters of the deep. OH—but what about those crabs—with their pinchers—just waiting to attack? 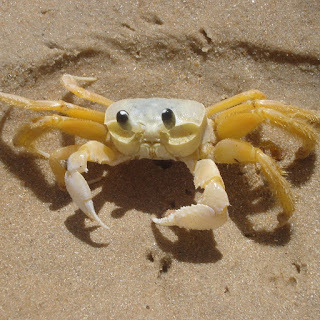 Burying themselves in the sand under our chairs and roaming the ocean floor, these critters can deliver a pinch with those claws if you happen to misstep. BUT how much damage could those claws really do? I dare say my mother, who was infamous for pinching to get our attention in public settings, posed much more of a threat than these funny little side steppers. It is fascinating to sit and watch their frantic efforts to evade the big foot in their midst. Burrowing in the sand and scurrying away, their aim is not to pinch, but to avoid the giant who invaded their home! 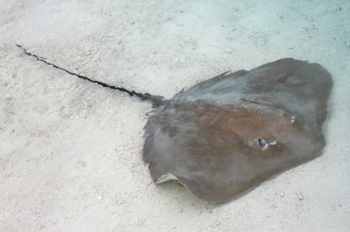 Do NOT forget—the sting ray—we ALL know what happened to Steve Irwin! Those graceful water flyers keep us from the water—for fear of their long beautiful tail. Coming all the way into the edge of the shore, we see them and refuse to enter the salty sea for fear of this critter who might sting us if we invade the deep. Yes, they can sting you, and yes, if you allow yourself to get close enough to their weapon of defense, you might be stung, AND if you are positioned correctly where their tail hits your chest—it could cause your death. They are NOT aggressive critters and given their space, they pose no threat. Why miss the beauty of their flight as they wave those beautiful wings—the birds of the deep gliding and soaring in their home in the deep? OH, but the biggest threat---the scare that keeps us on the beach with our toes clenched in terror---the SHARKS OF THE DEEP—who are always looking for a meal! Yes there are sharks—yes they are meat eaters—and yes they can be dangerous. BUT how many shark attacks are there in a year? It is much more dangerous to climb into your car day after day—than to step into the ocean. We have all watched too many shark movies and documentaries. The entertainment world loves to terrify us! Those movies which use real creatures of the deep seem to cause the greatest paralysis—for perhaps this could happen! Conquering our fears is a life long quest. To allow fear to dictate the parameters of living, short changes all God has blessed us to enjoy. Fear of storms, fear of water, fear of snakes, fear of critters—no matter how big or small causes us to back up—pause—and freeze. We lose the ability to access the true danger risk and miss out on the blessings, when we allow fear to rule the day. God gave us a brain for a reason—we are given the ability to evaluate and act reasonably. AND God desires to bless us with His creation, BUT He does not want us to live in the dread of the “What If’s”, instead embrace the “And & But”! I laughed out loud! 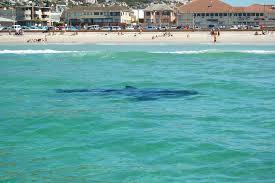 Yes I have seen sharks with legs too!! I guess because I grew up near the Atlantic Ocean, and spent many an hour there, what's in the water is not so frightening. It's the two legged sharks in suits spouting their "we only want to help you" nonsense that makes my blood run cold. Yes I agree & we have little or no control over avoiding them at times ! I think I'd rather be ignorant instead of imagining all those little guys gnawing at my feet. Apparently, you haven't seen the infamous movie "Sharknado"! haha I, for one, would rather bask in the sand and just listen to and watch the waves. I agree, fear does rob us of much joy!! !